These advanced students seemed to have a better perspective on the geometry course partly because of their math background, but I also believe from a maturity standpoint, these student do better than the freshmen in geometry. Thus, the seniors and juniors in the primarily freshmen geometry course outpace the freshmen regularly and find the course easier than the freshmen. One of the difficulties with offering geometry as a first year course is that it conflicts with the programs offered in science. In a number of high schools, chemistry is the second course in science. In our school, it was required of all students. Chemistry, if done properly, requires a command of algebra in solving formulas and in all sorts of measuring. Our students are usually taking chemistry when they are taking the first course in algebra and this results in watering down the chemistry a little, although one could teach the necessary algebra on an ad hoc basis, and get through adequately. Some of the science teachers have complained about this problem, and in our school, it is yet to be resolved. One of the advantages of the freshman geometry course is that it allows the students to go through the next three years without an interruption in the algebra sequence, algebra, advanced-algebra, and college algebra. This ordering of courses makes it easier on the student since he does not need a substantial review of algebra in algebra- trigonometry and the algebra-trigonometry course can proceed much better. Since high school physics is often a third or fourth year course, the student has enough algebra and geometry to meet the demands physics requires. It seems that more students have an easier time with algebra and pass it than geometry, however. This is possibly due to the adjustment factor in getting used to high school while at the same time adjusting to a course which is really very different than anything the freshman has encountered before in school. Some educational psychologists have contended that Euclidian geometry, geometry using theorems and qualitative deductive proofs, is better given in 9th grade before algebra 1 because the young mind is structured to deal spatially with the universe rather than algebraically. However, in my opinion it is the deductive and qualitative nature of Euclidian geometry that is especially difficult for young students in high school even in the traditional second year. Algebra 1 has many algorithms and is very straightforward. Most students, average or better, can, with help, use an example problem from the algebra text and apply it to relevant exercises. In traditional Euclidian geometry, there are no examples and exercises from which a young student can readily prove a theorem or corollary making mastery of the course much more difficult besides the requirement of having some command of basic algebra such as equation solving. However, a newer course, which I call calculating geometry, emphasizing calculating such as the solving of the Pythagorean Theorem, alternate interior and vertical angles and volumes of cylinders and cones, for example, I believe, can work for a 9th year student provided the teacher is prepared to teach or review the necessary basic algebra such as squaring and cubing numbers, and fundamentals of equation solving. If the students are at-risk, basic calculators can be utilized to ameliorate the problems some students will have with decimals and division. In summary, it has been my experience with 9th grade deductive Euclidian geometry given before Algebra 1 that there are difficulties with such a sequence. The standard high school geometry texts require a command of basic algebra and that the deductive qualitative method of roving theorems requires some maturity which is only beginning to develop in the students’ second year. 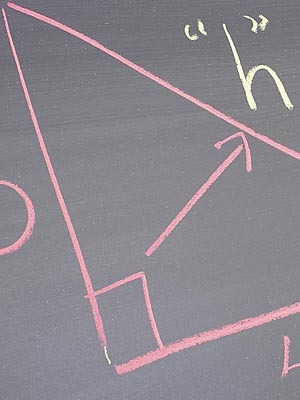 A 9th grade course in calculating geometry is realistic provided the student has some basic algebra in elementary school or the fundamentals of algebra are taught as needed in the geometry course.